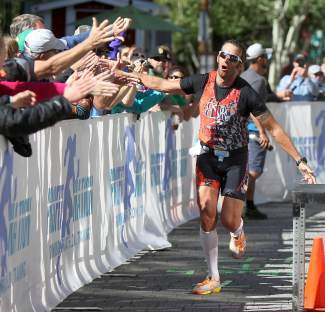 Australian Chris McDonald receives high-fives as he nears the finish line of the inaugural Ironman Lake Tahoe in 2013. They could be watching football from their couches. Instead, thousands of extreme triathletes will punish themselves for an entire day Sunday for the reward of completing one of the world’s toughest races — Ironman Lake Tahoe. The race returns after a successful, albeit chilly, inaugural event in 2013, when an overnight storm capped the surrounding mountains with snow and left frigid temperatures for the 6:30 a.m. swim start. There are no early-season snowstorms in the forecast this year. There is, however, a major wildfire near Pollock Pines that has spewed smoke into the Lake Tahoe Basin since Sunday, and has Ironman officials on high alert. Keats McGonical, operations manager for Ironman, said officials are optimistic smoke from the King Fire will begin blowing west, away from Lake Tahoe, before Sunday’s race. The fire burning west of South Lake Tahoe is growing rapidly in size, and will likely breach 100,000 acres this weekend. Athletes could use all the air they can get. With the entire course situated near or above 6,000 feet in elevation, Ironman Lake Tahoe is arguably the most difficult Ironman on the planet. It starts with a 2.4-mile swim off the shore of Kings Beach. Athletes then face a daunting 112-mile bike ride with more than 8,000 feet of climbing — a double loop through Tahoe City and Truckee and over Brockway Summit. The race ends with a 26.2-mile (marathon) run along the Truckee River. Last year’s overall winner, Ironman pro Chris McDonald of Australia, needed just under nine hours (8:55:14) to complete the course, while the average participant is lucky to finish in 12 to 14 hours. LaPoint finished in 11:03:01. Fellow Ironman pro Joe Gambles called the course “incredible” after finishing third overall, about seven minutes behind McDonald. Despite the inevitable pain they will endure, some 3,000 athletes are expected to compete in the Ironman Lake Tahoe or Ironman 70.3 Lake Tahoe, a half-distance Ironman that takes place the same day and on the same course. Not surprisingly, many of the participants call Tahoe home. Their reasons vary for their willful participation in such a demanding event. “It felt like the right time to challenge/torture myself this way,” said Robert Wright of Kings Beach. “I just love the challenge and to compete against other strong athletes,” said Donatas Ereminas of Truckee. Kevin Murnane of Tahoe City was motivated by his wife, who completed the race last year. Sierra Sun Managing Editor Kevin MacMillan contributed to this report.